The Intertribal Technical-Assistance Working Group on Special Domestic Violence Criminal Jurisdiction (ITWG) has participated in a series of webinars focused on defendants’ rights issues (including indigent counsel); the fair cross section requirement and jury pool selection; prosecution skills; and victims’ rights. A webinar was also held to review DOJ’s Application Questionnaire for the Pilot Project. In coordination with the Tribal Law and Policy Institute, NCAI hosting this webinar on April 5, 2013. 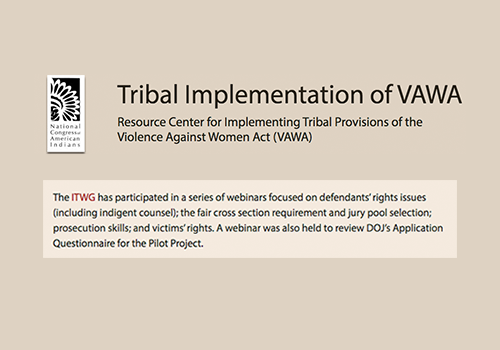 In this webinar, panelists discussed the Violence Against Women Act (VAWA) provisions that expands tribal court jurisdiction over all persons for certain crimes committed on the reservation.